At these 11 restaurants, the views are just as jaw-dropping as the dishes. Everything is over-the-top in Vegas. So it’s no surprise to find that the city is also home to America’s tallest observation deck (up 844 feet!). 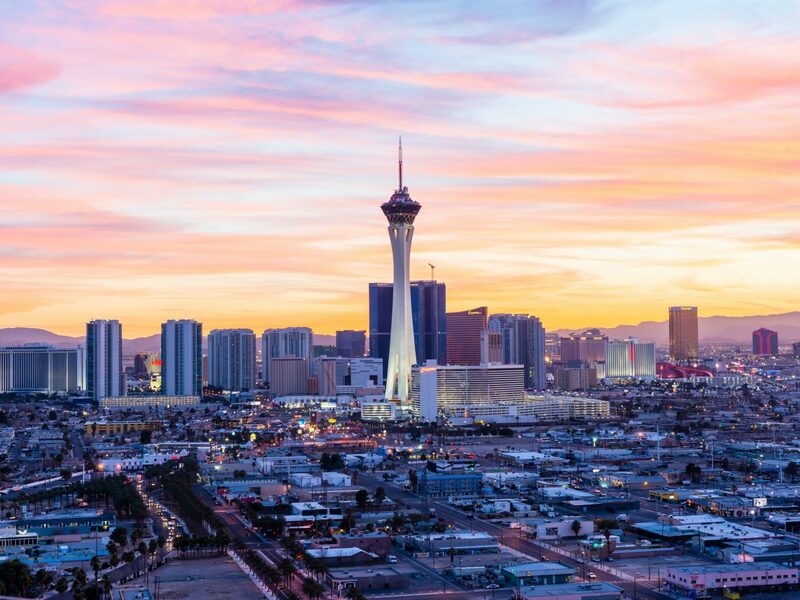 The Stratosphere Hotel’s Top of the World Restaurant displays spot-on Sin City vistas as the restaurant revolves 360 degrees in 80 minutes. Snag a coveted window-side table, where you can tuck into lobster bisque with a brandy cream or Kurobuta pork belly with crispy basmati. 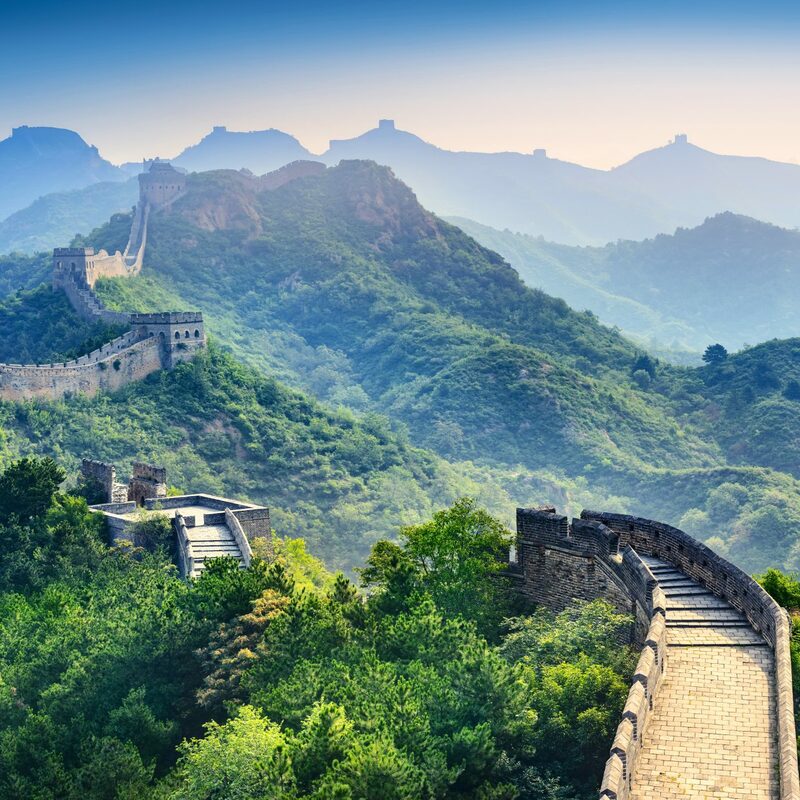 China has some of the tallest buildings in the world. 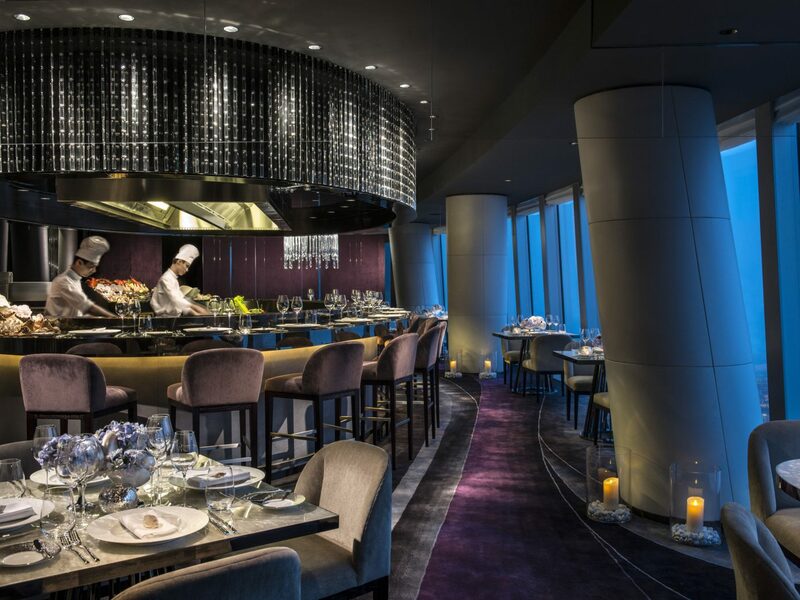 In Guangzhou, reserve an evening at Catch, on the 100th floor of the Four Seasons. The seafood-heavy menu features Alaskan King Crab gratin, lobster three-ways, market oysters, and an impressive platter of prawns, clams, mussels, and more. Plus, diners can watch the chefs at work from the open kitchen, that is, as long as they can peel their eyes from the picture-perfect views. At 1,378 feet, the Ritz-Carlton skyscraper is guaranteed to have one hell of a panorama — it is the world’s highest hotel after all. 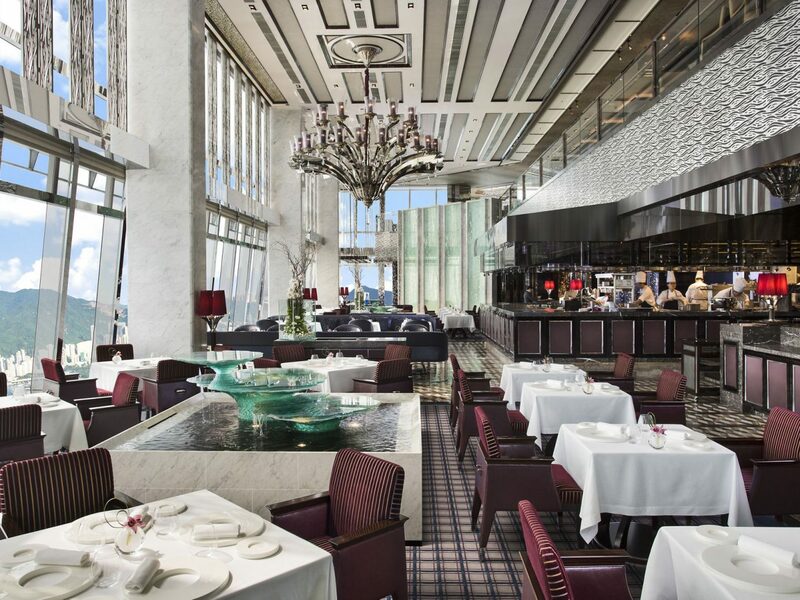 But its prime perch is Tosca, a Michelin-starred Southern Italian restaurant on the 102nd floor. 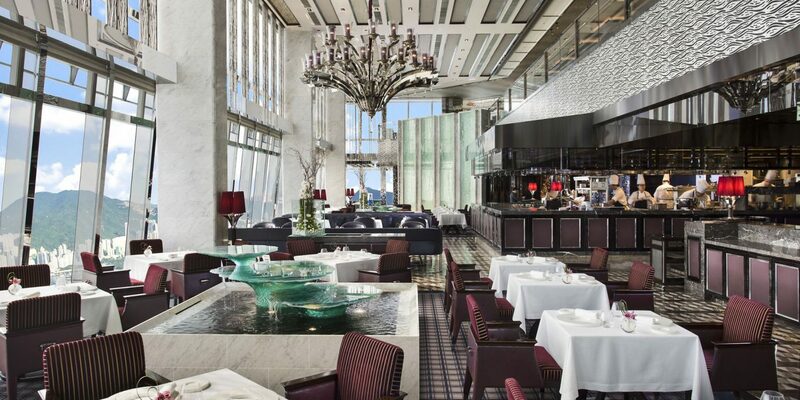 Look out over the Hong Kong harbor while you dig into inventive dishes, including red prawn carpaccio with Prunier Saint James Caviar and parsley cream, and Australian Wagyu beef tenderloin in charcoal, foie gras and potato purée. After finishing the feast, head up to the top floor where Ozone—the world’s highest bar—plays DJ sets until 3 a.m.
We try not to pick favorites, but it’s pretty hard to beat the rooftop at Lebua at State Tower. 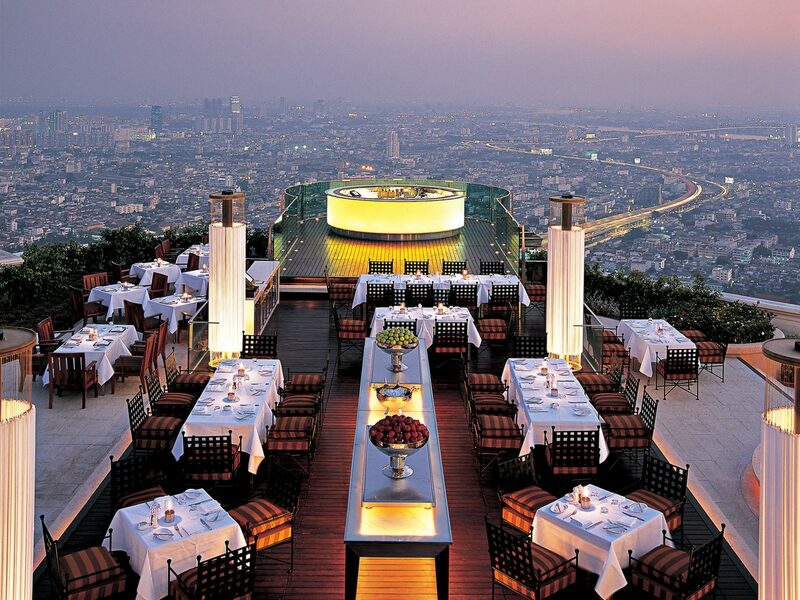 Celebs and A-listers crowd the hotel’s vertigo-inducing Sky Bar (820 feet up) that hovers above Bangkok. 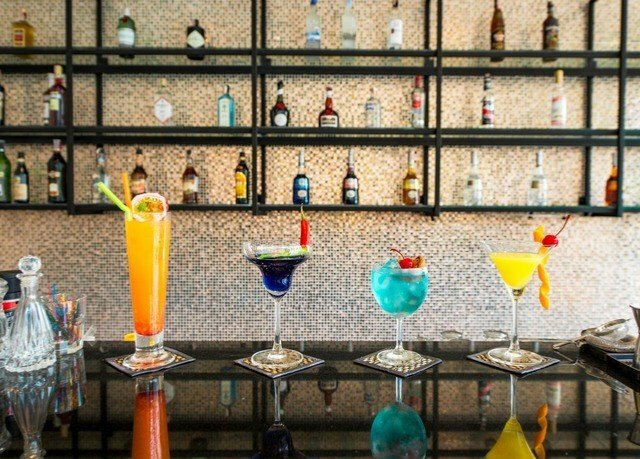 Order a boozy mango Poptail and watch the sunset before having dinner at Sirocco, the world's highest alfresco restaurant. It’s worth the splurge for the eight-course tasting menu, which features a mouthwatering 48-hour Wagyu short-rib with its own rich jus. 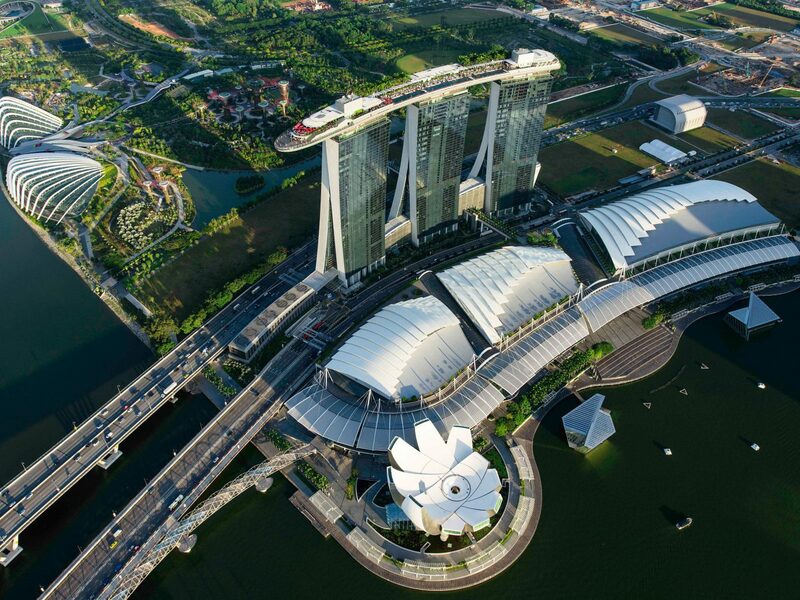 Marina Bay Sands is one of Singapore’s most famous buildings, thanks to the three hulking towers linked by a rooftop terrace of bars, restaurants, nightclubs and a massive infinity pool. 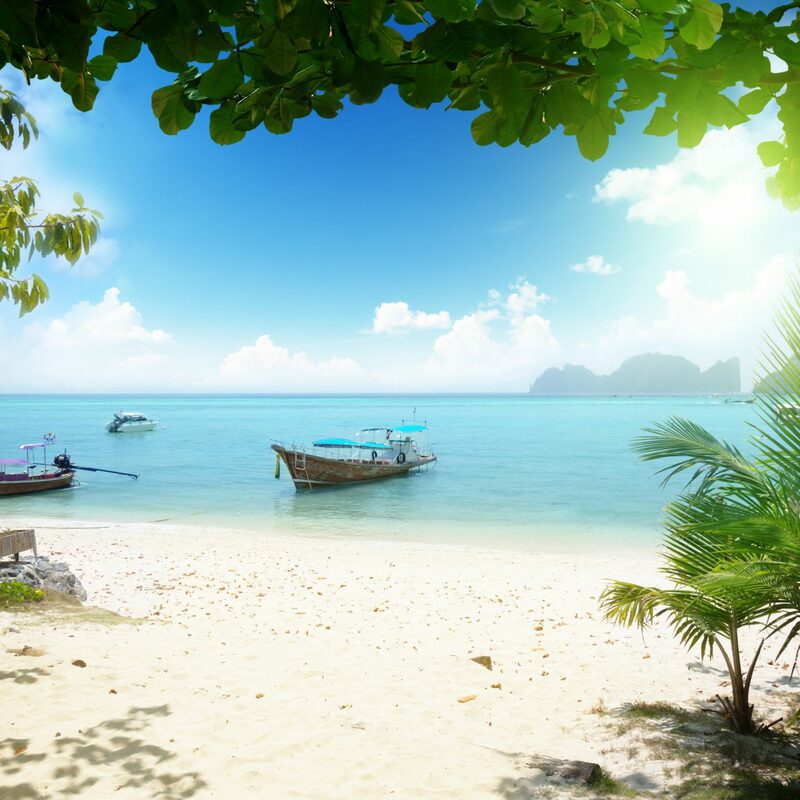 But of all the options, we love Sky on 57 for celeb chef Justin Quek’s Asian fusion fare paired with 360 sights across the Pacific to Malaysia. Try the squid ink xiao long bao stuffed with baby abalone, blue swimmer crab and Iberico ham. The award-winning rooftop restaurant, La Terrasse Cuisine & Lounge, is the Sofitel’s star attraction. 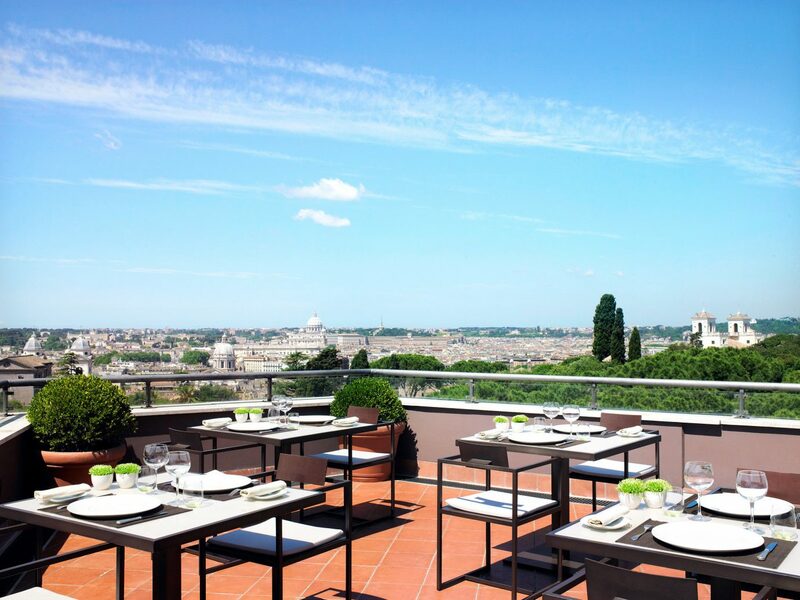 The sleek space offers direct views from every seat, and the outdoor terrace is the place to sip cocktails and watch the sun set over the Eternal City. Reserve a table in advance to tuck into Mediterranean dishes such as veal tagliata with roasted eggplant, black garlic, tomato petals and a port wine reduction. 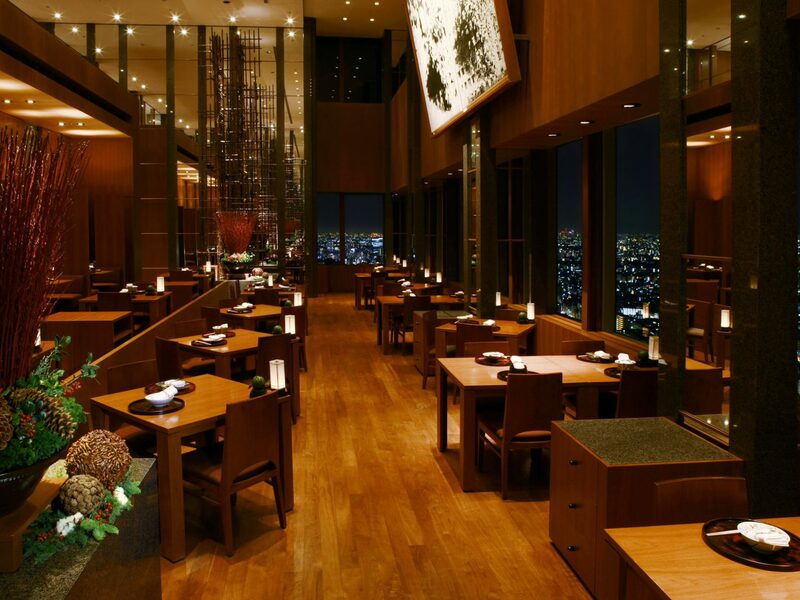 If you’ve ever seen Lost in Translation, you’ll recognize the Park Hyatt Tokyo’s fine-dining spot, Kozue, where Bill Murray famously looked out over Japan’s bustling cityscape and Mount Fuji. Score a seat and indulge in some sake and home-style hotpots (the softshell turtle and blowfish are musts). This swanky rooftop restaurant has a lot going for it: the spot-on sea vistas, a Michelin star and kickass Catalan cuisine. Head up to the 24th floor of Melia Barcelona Sky hotel to Dos Cielos’s outdoor terrace, aka the hotspot to see and be seen. 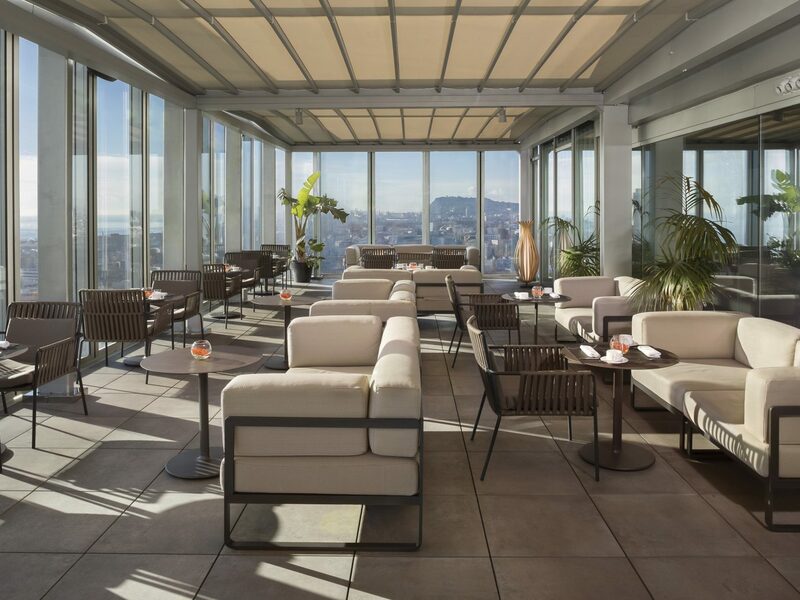 While taking in the views (and some booze), try to save room for the tasting menu, which includes crispy Iberian suckling pig as well as foie gras ravioli with sundried tomatoes and black olives. Greece is no stranger to gorgeous settings, but the cliff-side Lycabettus at Andronis Luxury Suites may top the charts. 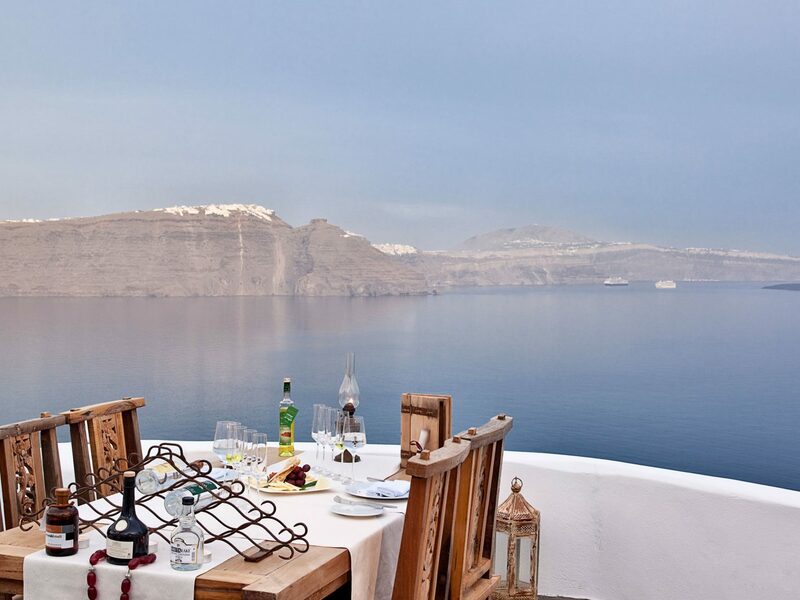 Grab a private table on the dramatic rocky outcrop that juts out over the turquoise Aegean Sea. The Mediterranean menu complements the landscape, with Greek dishes like fresh veggie salad with white truffle vinaigrette and flowers in volcanic soil, plus a rack of lamb with eggplant mousse and lamb-braised croquettes. New York has a wealth of bars and restaurants with Empire State views. 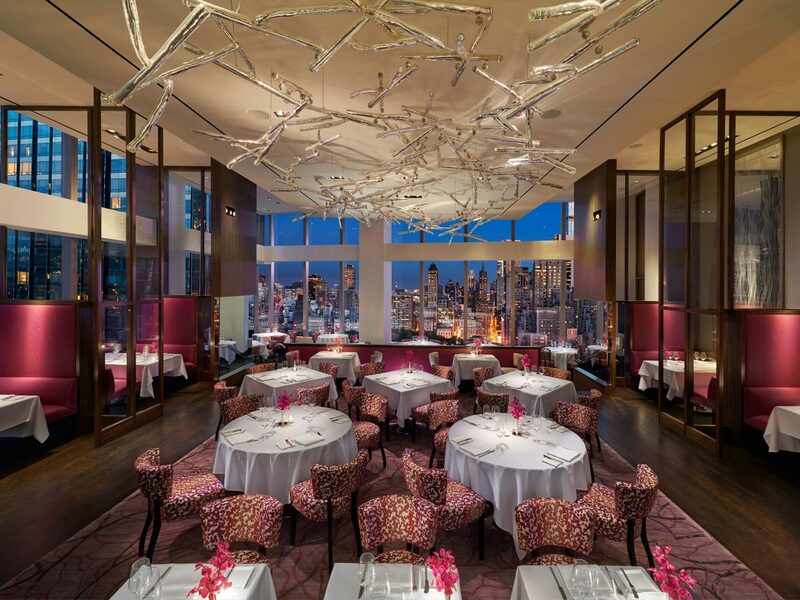 But Mandarin Oriental’s 35th floor Asiate takes the crown. Not only does the elegant dining room have floor-to-ceiling picture windows that frame Central Park, it’s also got an uber-talented culinary team that takes cooking to an art form. Order the hamachi crudo with sea urchin custard and lemon verbena to start, then the arctic sea char romanesco with kalamata olives and charred grapefruit as the main affair. 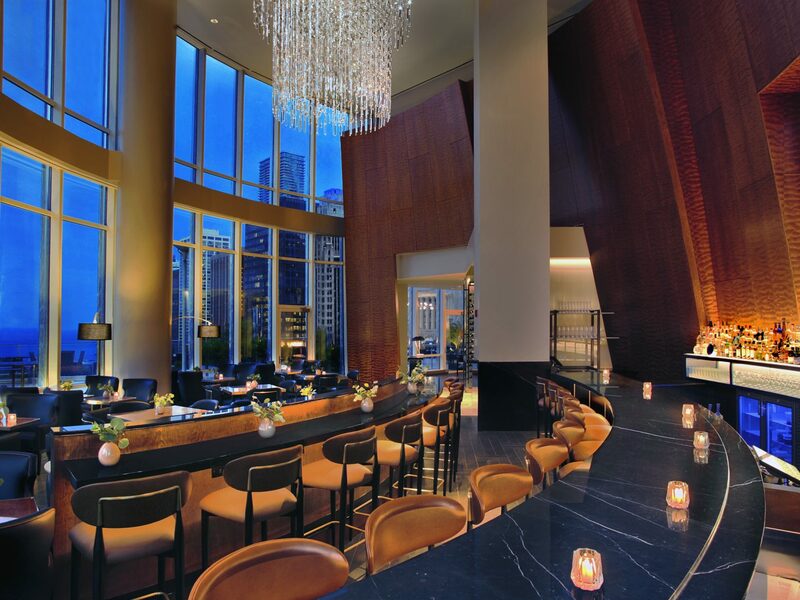 At Terrace 16 in the Trump International Hotel & Tower Chicago, the focus is all on the view—namely, the Chicago River, Lake Michigan, and the cityscape from dazzling floor-to-ceiling windows. 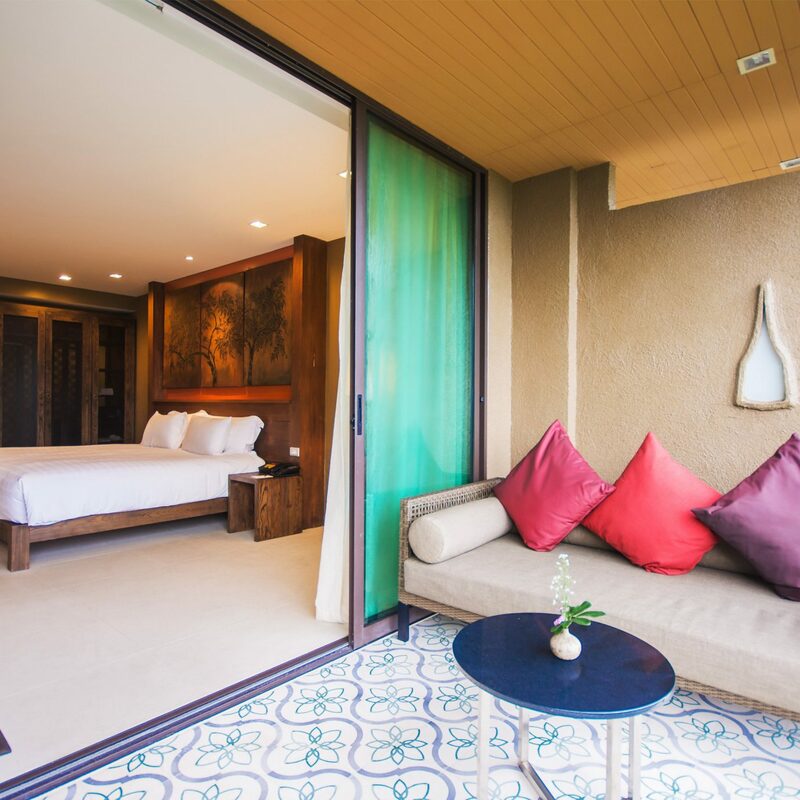 As its name suggests, Terrace 16 involves both an outdoor patio (which can seat up to 200) as well as an elegant indoor dining room with a buzzy bar and even better food. The Prince Edward Island mussels and the Naked Burger are two standouts, but everyone raves about the hot chocolate soufflé made with orange liqueur and marshmallows.